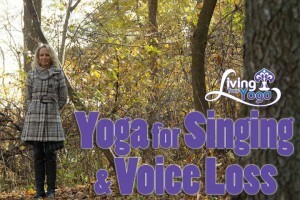 Yoga and my singing voice! Hello, I became a member July 22, 2013. I’m a middle school teacher and have always found my calm and “center” through my recreational singing. (Community Theater etc.) About 8 years ago I lost my voice and I just gave up. Age, stress – whatever- took control. I found a vocal coach in June 2013 and took the risk of finding out if my vocals could return. She suggested I try Yoga as one of my tools to find myself again. THAT’S WHEN I FOUND YOUR SITE! I am hooked, and a fabulous connection has been made. Welcome. I love hearing about your story. So interesting! Everybody has such an interesting, unique and winding road to yoga! I’m so glad you found us! I’m so happy to hear that you are singing again, and for YOU! 🙂 That’s great news. I do have some video suggestions for you. Yoga for Posture would be great for that clenching and hunching over. The chakra series would be great, but especially the 5th chakra class. The Durga series had a mantra at the end of each class which is great or your voice had a mantra at the end of each class. The fifth chakra class from Namaste Yoga is a free class! from Namaste Yoga. And that should keep you busy for a while! Looking forward to getting to know you better on the membership site!